Multipurpose labels can be erased and re-used. Use a permanent marker to write on the label, and then simply erase the writing with a white eraser once you are ready to update your label. 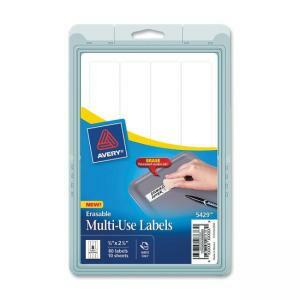 Apply Erasable Labels to a variety of surfaces including paper, plastic, glass, metal and vinyl. Strong, durable labels are perfect for identifying plastic storage containers, cardboard boxes and files. Labels are not designed for use with printers.